I've been in my fair share of business meetings, some of them effective meetings that followed some agreed-upon business etiquette, some not so much. One thing they tend to have in common is a certain set of jargon, probably intended get a certain message across but usually succeeding only in confusing or angering people. There may be no perfect way to run a meeting, but there are some best practices. Here are some of the phrases I wish I could just erase from the business person's lexicon. I know not everyone is going to come up with ideas that will work. I know that sometimes you will see the "problem" with the solution offered and want to make that problem known. There's no issue with making the problem known, but you need to keep in mind how you bring it up. Telling someone there's a "problem" with their solution does not necessarily ensure that anyone will offer ways of fixing the problem, but it can keep people from wanting to offer solutions. Mention what might work better while building upon the original idea instead. I've worked with some smart people throughout my career. Some of them worked for companies I truly respect or went to schools with unmatched reputations. The thing is, while I value their experiences, I do not want to duplicate them. Telling me the way things were at your old place of employment or education usually doesn't help address the issue and can come off as arrogant. Also, this phrase can seem to diminish the current issue. If you know a great solution, let me know, but keep where it came from to yourself. The thing with this phrase is not necessarily that addressing extraneous issues outside of the meeting is a bad thing. On the contrary - it's great. You're keeping things focused during the meeting, and that's important. The problem with this phrase is that it's so rife with corporate jargon that I can barely remember what it means. Just tell me you'd like to discuss that later. I know what that means. I hear this far more often than is necessary. Sure, people are going to bring up issues in a meeting that might not be necessary. Maybe there's already been a solution agreed upon and that person does not yet know it. But whatever the situation, "That's not really a problem" is a great way to make sure that problems aren't brought up in your meetings anymore. You stifle communication when you tell people their concerns aren't legitimate. Who knew? Where's the Single Point of Failure? This is a new one on me, but I've heard it in enough business meetings to put it on this list. Where is the single point of failure? You, for asking that question! We're a company - a team. There is no single point of failure, but there are probably multiple points of opportunity. Opportunities to help address any issues your co-workers might be having: Let's talk about those. 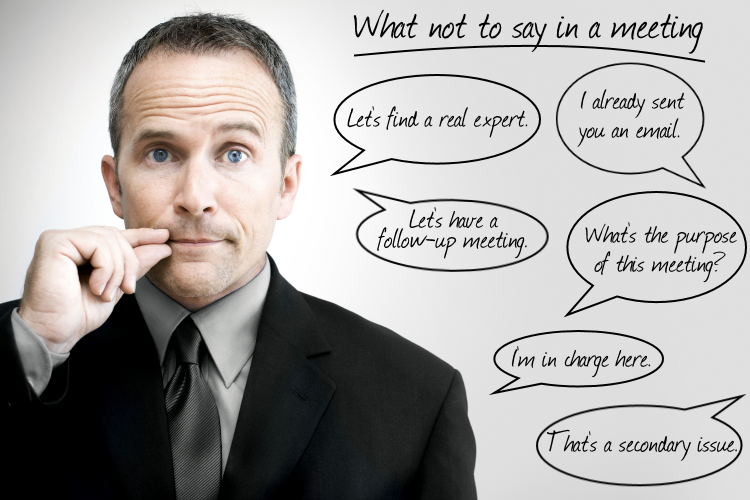 The Top Things that You Should Always Avoid Saying in a Meeting - InLoox • Copyright 1999-2019 © InLoox, Inc. All rights reserved.